Let’s say you’ve built a great community of users who love your product and engage with it often. But you still think you can do more, and want to create an even better user experience. So you talk to your customers, research how they’re currently engaging with your platform, and discover a pain point that your product is uniquely positioned to solve. Based on what you learn, you design a new feature or big change to your product that is going to improve your users’ lives. But even after all your hard work that went into researching, designing and building this product change, the biggest risks still remain. Will your customers use it? Will they like it? How you introduce your change to existing users is critical to the success of your feature launch. Just because a user has been active for a few days (or months/years for that matter), doesn’t mean that they too don’t require the gradual engagement, careful copywriting, and personalization that gets new users to stick around. In fact, some of your most engaged users will be the most resistant to change. To ensure your users understand and activate your new feature, follow these strategies before you ship. When communicating a new feature, don’t talk about the feature itself. Yes, blood, sweat and tears went into building the feature. But your user doesn’t care about that. The goal is to convey not how the product is changing, but rather how a user’s abilities are expanding: how the value they get is deepening, how their lives just got easier, faster or more productive. That’s what you must communicate. When Google launched a new version of Maps, they did just this. Rather than announcing that Google Maps now supports bike routes, it says, “Get where you’re going, faster.” Rather than mentioning that it’s now optimized for multiple platforms, the announcement says, “Your map, wherever you are” and claims that your favorite places will be available on your mobile version of Maps too. From a user perspective, the benefits of this version of Maps are crystal clear. For most products, usage patterns are highly concentrated to 1-3 pages on your platform, or your “path”. You want to ensure all the right people see your feature announcement. If you make the announcement outside of the path, you run the risk of little to no feature activation just because few people see it. Google did this when introducing functionality with Google Wallet. Presumably, Google Wallet is in the long tail of Google’s app usage. So Google put the announcement in the user’s path. 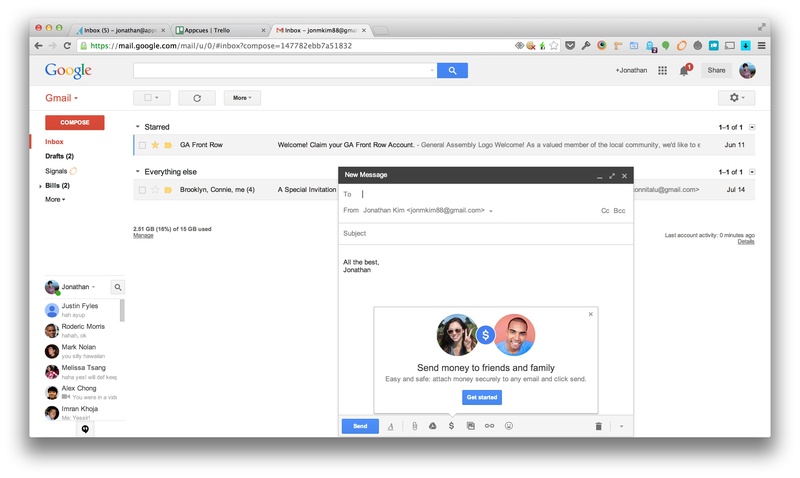 When opening a new draft in Gmail, users were prompted with an announcement about Wallet. When clicked through, users can activate their Google Wallet account and enter their credit card information without even leaving Gmail. While you want to maximize the audience size of your message, you need to balance this with the need to make it contextual. Your goal is to drive as many users to take meaningful action as soon as possible. Many times users in your most high traffic areas, like just upon login, are not prepared to make good use of the feature. 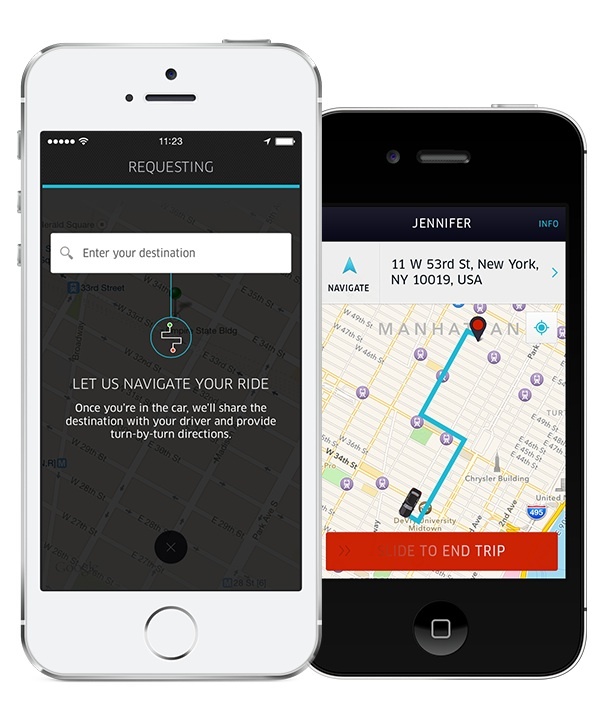 When Uber announced the ability for riders to automatically share their destination information with drivers, they put the announcement further downstream. Instead of showing the change when the user comes back, Uber waited until they had actually requested a ride so they can demonstrate the feature right when it’s relevant for the user to activate it. This helps more of them take action right away, and increases habitual use of the feature after the first experience. Chances are, not all of your users follow the same exact path to become an engaged user. This may mean that of 10 randomly selected users, there are 10 different features that they haven’t activated. The next action you want a user to take is a function of what she has already done, and therefore you need to personalize your recommendations. Facebook does this with their profile completion widget in its News Feed. Rather than affixing a “Complete Your Profile” call to action at the top of News Feeds, Facebook goes a layer deeper and asks for the specific profile information that is missing. 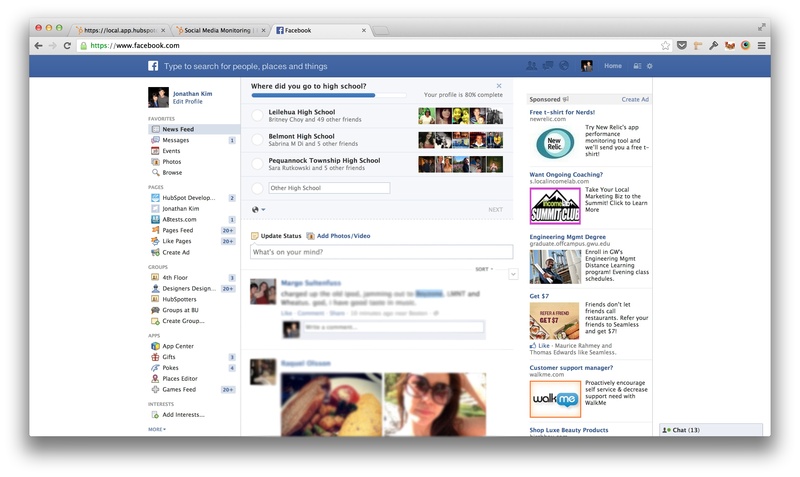 Other widgets shown are recommended friends to add, publishing your first post, and more. This technique works really well when you view onboarding from the lens of the user rather than your product. While much of your onboarding experience should focus on how the user benefits from the change rather than what has actually changed, there are a few occasions when you should make the conversation about the product itself. One of those is when you introduce a user interface that will be unfamiliar. The last thing you want to do is confuse a user when your goal was to create a UI that will actually benefit her. 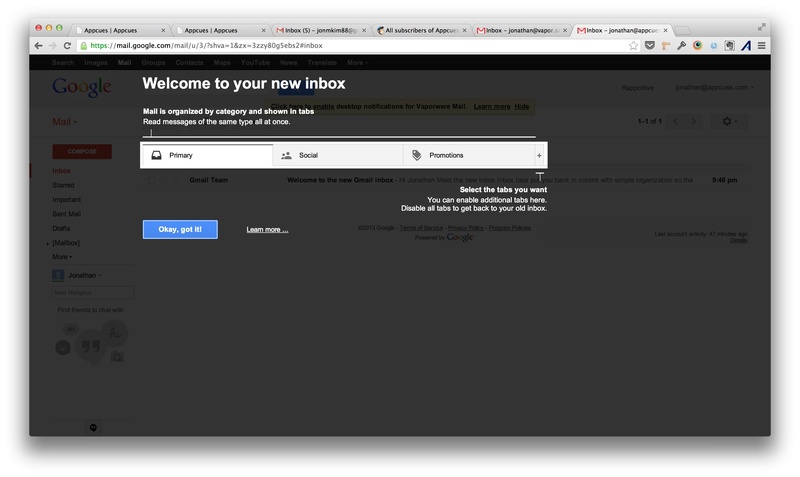 When Gmail announced inbox categories, it used coachmarks to ensure users would see the three tabs. It’s hard for users to overlook this UI change. While this annotation helps introduce the new UI, the copy certainly leaves much to be desired. Gmail still could have emphasized a benefit to the user: by using categories, your inbox—and your life—will be more organized. Does my messaging clearly communicate the benefits of using this new feature? Does my announcement drive users to action? Have I taken measures to eliminate confusion? If the answer to these four is yes, then you’ve crafted a solid existing user onboarding experience. But remember, it’s always a good idea to get customer feedback, both on your new feature and on the way you announce it. You may want to stage gate your release to a subset of your total users and closely follow your feature activation goals. Or you could set up some user tests and customer interviews to collect feedback.